1. Meaning the same, or almost the same, as another word in the same language, or being an alternative name for someone or something: The teacher told her students to use synonymous words in their writings instead of repeating the same word several times. 2. Having an implication similar to the idea expressed by another word: If one person, thing, or idea is synonymous with another, there is an extremely close connection between them, so someone can't think of one without also thinking of the other one. © ALL rights are reserved. 1. 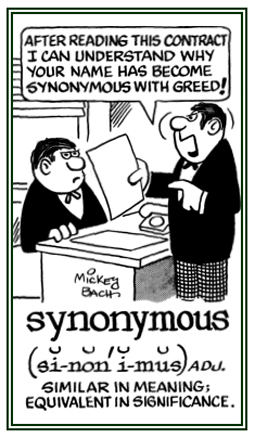 The state of being a synonym. 2. The semantic relation that holds between two words which can (in a given context) express the same meaning. 3. The study, classification, and distinguishing of synonyms. 4. The relation between two words or phrases with the same meaning; such as, "gift" and "donation". 1. A scientific name in which the same word is used for genus and species (Chloris chloris; the greenfinch). It is said that this practice is no longer approved by the International Code of Botanical Nomenclature. 2. A taxonomic designation; such as, Gorilla gorilla and Apus apus (common swift); in which the genus and species names are the same, commonly used in zoology but no longer in botany. 3. Words that are double strings: "The following words are tautonyms: beriberi, booboo, coco, mama, murmur, and papa." A reference to a scientific name in which the generic and the specific names are the same; such as, Chloris, chloris (the greenfinch). The state of having the species or subspecies name identical to the generic name of the genus in which it is placed. Absolute tautonymy is the identical spelling of a generic or subgeneric name and the specific or subspecific name of one of its originally included nominal species or subspecies. Linnaean tautonymy is the identical spelling of a new generic or subgeneric name established before 1931 and a pre-1758 name cited as a synonym of only one of the species or subspecies originally included in that genus. Virtual tautonymy is the nearly identical spelling, or the same origin or meaning, of a generic or subgeneric name and the specific or subspecific name in a binomen or trinomen (not a term regulated by the International Code of Zoological Nomenclature). The custom of certain savage races of naming the parent from the child. 1. A place-name; a name given to a person or thing marking its place of origin; for example, pharos refers to a lighthouse and is based on Pharos, a peninsula in Northern Egypt, site of an ancient lighthouse built by Ptolemy, one of the "Seven Wonders of the World". 4. The place-names of a country, or district, as a subject of study; for example, London, Mount Everest, and San Francisco, Death Valley, etc. The etymological study of place names. A person who utilizes a place-name, or a name given to a person or thing, marking its place of origin. 1. A place name; such as, London, or Mount Everest. 2. A word derived from a place name; such as, "champagne", from "Champagne" in France; or "cashmere", from "Kashmir" in India. 1. A branch of lexicology that studies the place names of a region or a language. 2. The place names of a region or language and the study of such place names. 3. Anatomy nomenclature which refers to a region of the body rather than to its organs or structures. Showing page 12 out of 13 pages of 184 main-word entries or main-word-entry groups.